NEW YORK (AP) Anthony Davis’ fullcourt heave after the third quarter was too late to give him points, though it gave him that unstoppable feeling great players get. And thanks to his monster effort, it became the Pelicans’, too. 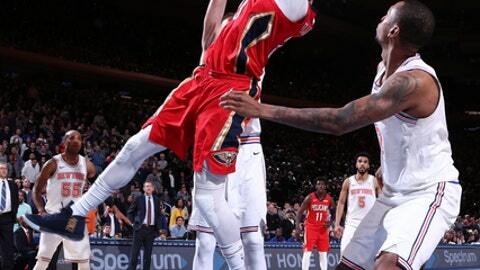 Davis scored a season-high 48 points and grabbed 17 rebounds, leading New Orleans back from 19 points down late in the third quarter to a 123-118 overtime victory over the New York Knicks on Sunday. Jrue Holiday added 31 points, and DeMarcus Cousins had 15 points, 16 rebounds, seven steals and five assists and for the Pelicans. They were down 16 after one, even further back late in the third and still down nine with 4 1/2 minutes left in regulation. Five days after a double-overtime loss to Chicago in a game they led by 11, the Knicks coughed up another big lead in a miserable way to finish a rare January home game before they begin a seven-game, coast-to-coast trip Monday in Brooklyn that has them away for two weeks. The Knicks seemed in control late in a high-scoring third quarter, when they outscored the Pelicans 39-34. Hardaway’s jumper gave New York a 96-77 lead with 1:22 remaining in the period, but New Orleans then went on a 17-4 run to cut it 100-94 midway through the fourth. The Pelicans then finished regulation with a 13-4 charge, tying the game on Davis’ basket with 3.5 seconds remaining. New Orleans then nearly won it, as E’Twaun Moore stole an inbounds pass and launched a 3-pointer that rimmed out at the buzzer. Holiday put New Orleans ahead for good with 1:52 to play in OT and Davis had the next basket, making it 120-117. The Knicks, playing the first of back-to-back afternoon starts, jumped to a 29-13 lead after one quarter. Pelicans: Davis has scored at least 35 points in each of his last three games at Madison Square Garden. … PG Jameer Nelson missed the game for personal reasons. … The Pelicans signed guard Mike James, who played for Phoenix earlier this season, to a two-way contract. He didn’t play. Knicks: The Knicks signed former lottery pick Trey Burke, who had been playing for their G League affiliate and was second in the league with 26.6 points per game. The No. 9 selection in the 2013 draft has averaged 10.6 points and 3.6 assists in 267 career games with Utah and Washington. Knicks coach Jeff Hornacek said during the summer Burke told the Knicks he was interested in playing for their G League team and learning their system, rather than signing a deal with another NBA team. Hornacek speculated that may have been because the Knicks’ point guard situation was unsettled at the time and maybe Burke saw an opportunity, but Burke explained otherwise. The game featured three straight winners of the AP college basketball Player of the Year award. Davis won in 2012 for NCAA champion Kentucky, Burke won the next year when Michigan was the runner-up, and the Knicks’ Doug McDermott won in 2014 at Creighton. Pelicans: At Boston on Tuesday night. Knicks: At Brooklyn on Monday.